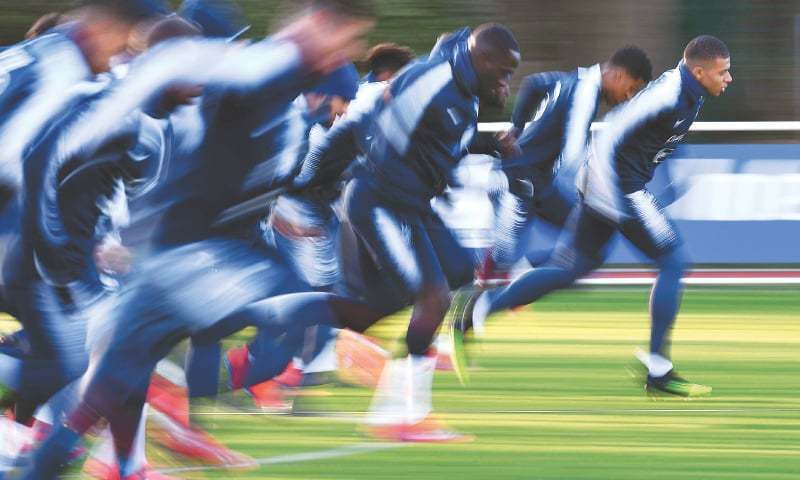 PARIS: Few big teams need to sweat the 2020 European Champ­ionship qualifiers, but for Germany the pressure is already on. After a terrible 2018, Joachim Loew’s new-look squad are aiming for revenge against the Netherlands, who helped relegate Germany in the inaugural Nations League last year. Elsewhere in the opening two rounds of games, there’s a rematch from the 2016 European Championship as World Cup champions France host Iceland on Monday in Group ‘H’. England’s young squad face two eastern European teams in the Czech Republic and Montenegro in Group ‘A’. Qualifying for next year’s 24-team tournament is low-risk for many top teams, since two nations qualify from each of the 10 groups. The revamped playoff system means 16 countries have a safety net. In other matches, World Cup semifinalists Belgium host Russia in the pick of the opening day’s games on Thursday. Portugal face on-form Ukraine on Friday and on Saturday, Spain are against Norway and out-of-sorts Italy host Finland. Few international coaches have Loew’s staying power. He is still in charge despite Germany failing to advance from the group stages at the World Cup and the Nations League groups, and recording just one win in their last seven competitive games. Germany’s first European qualifier on Sunday is their toughest away to the Netherlands, who beat them 3-0 in Amsterdam in October. “Some players now have to take the next step and take it up a level,” Loew said when he introduced a revamped squad that was missing Bayern Munich trio Thomas Mueller, Mats Hummels and Jerome Boateng. With close to 250 internationals between them, Hummels (70 caps), Mueller (100) and Boateng (74) were part of the same generation which won the 2014 World Cup, thrashing hosts Brazil 7-1 along the way. Germany are Group ‘C’ favourites along with the Dutch — who start Thursday against Belarus — with Estonia and Northern Ireland the other teams. But Germany director Oliver Bierhoff also asked the German football community for patience as the young players were bound to make mistakes. England manager Gareth Southgate is relying on young players even more than usual as qualifying begins. His squad for the Czech Republic on Friday and Montenegro on Monday contains two players born in 2000: Jadon Sancho and newcomer Callum Hudson-Odoi and just one born in the 1980s, back-up goalkeeper Tom Heaton. Declan Rice, the 20-year-old West Ham United midfielder, is available to make his England debut after switching allegiance from Ireland. Of the older players from the England squad which reached the World Cup semi-finals, Jamie Vardy and Gary Cahill have retired from international football, while Ashley Young hasn’t been selected since the tournament in Russia. The Czech squad is missing first-choice goalkeeper Tomas Vaclik, who has an abdominal muscle injury, and playmaker Borek Dockal is a doubtful starter because of a calf muscle problem. Cristiano Ronaldo has been included by defending champions Portugal for the first time since the World Cup for their matches at home to Ukraine and Serbia. The 34-year-old sat out the Nations League in the autumn by “mutual consent” with coach Fernando Santos and Portugal showed they could manage without him, sailing through four games against Italy and Poland unbeaten. However, Santos, rebuilding the team after their round of 16 exit in Russia, waved away suggestions that Portugal no longer need their most capped player and all time leading scorer. Apart from Germany, no team is under more pressure than Italy after they failed to even qualify for Russia and then finished behind Portugal in the Nations League. Roberto Mancini’s team face a potentially tricky Group ‘J’ which includes Bosnia and Greece although they start with relatively straightforward matches at home to Finland and Liechtenstein. Mancini has stuck by his decision to prioritise youth, leaving out experienced players such as maverick forward Mario Balotelli and Torino striker Andrea Belotti while including youngsters Nicolo Zaniolo and Moise Kean. “[We need] to score more, considering the chances we create, retaining the same will to attack of the last games, and the ability to defend when it is needed,” coach Mancini said. Euro 2008 and 2012 winners Spain are also in a transition period under coach Luis Enrique as they open their Group ‘F’ campaign against Norway, with Sweden, Romania, Malta and the Faroes the other opponents. “I prefer to see it as evolution rather than revolution,” said Luis Enrique who has picked 41 players in four call-ups. France can start the latest Euro campaign, after losing the 2016 final at home against Portugal, in an upbeat mood as world champions. Coach Didier Deschamps welcomes winger Kingsley Coman back from injury and warned that a successful qualifying campaign in Group ‘H’ which also includes Turkey, Iceland, Alobania and Andorra “will depend a lot on us”. To mark 60 years of the European Championship, the final tournament spreads out across 12 cities across the continent: Amsterdam, Baku, Bilbao, Bucharest, Budapest, Copenhagen, Dublin, Glasgow, London, Munich, Rome and St Petersburg. If all the hosts were given spots at the tournament, they’d make up half the draw. That makes 2020 the first European Championship in 44 years where hosts must qualify. Some will miss out. Azerbaijan faces the toughest task in having to win a qualifying spot in Group ‘E’ ahead of Croatia and Wales, while fellow hosts Hungary and Scotland aren’t exactly regulars at major tournaments, either. Qualified host teams will have at least two group games in their home stadium. Each city has three group games and a last 16 or quarter-final match, while the semi-finals and final are at Wembley. Some teams already know they’ll get a second chance thanks to UEFA. The top two teams in each group qualify automatically, just as they did for the 2016 tournament, but the playoff system is very different. Playoff places are decided by how well teams performed in the Nations League in Autumn last year that split the 55 members into four tiers (League A-D) with four groups in each. Those nations are England, Netherlands, Portugal and Switzerland from League A, Bosnia and Herzegovina, Denm­ark, Sweden and Ukraine frim League B, Finland, Norway, Scotland and Serbia from League C and Belarus, Macedonia, Geo­rgia and Kosovo from League D.
If a Nations League group winner also finishes in the top two of their qualifying group, their spot will go to the next best-ranked team in their league. For example, Belgium go to the playoffs if they doesn’t qualify automatically but at least one of Switzerland, Portugal, the Netherlands and England do. The playoffs are in March 2020.